Cheese provides your body with essential nutrients during pregnancy, including calcium and protein. Adding healthy cheeses to your pregnancy diet also helps you consume minerals and vitamins your baby needs to properly develop. However, there are certain cheeses that should be avoided because they are commonly made with unpasteurized milk, which elevates your risk of contracting a food-borne illness, according to Vincent Connelly and Hope Ricciotti, authors of "The Pregnancy Cookbook." Mexican cheeses, such as queso fresco, are normally made using unpasteurized milk, according to "The Essential Pregnancy Organizer" by Antoinette Perez and Dani Rasmussen. Since many Mexican entrees include queso fresco, it is vital to inquire about the ingredients in a specific dish. Unpasteurized queso fresco can often cause listeria, a life-threatening illnesses for unborn babies. As a health measure, Perez and Rasmussen recommend ordering cheese that is heated until bubbly, as this can kill germs that could potentially make you and your unborn child ill. You can substitute safe cheeses including Colby, pepper jack and cheddar in place of queso fresco. Examples of other soft Mexican cheeses pregnant women should avoid include queso de hoja, queso blanco, asadero varieties and queso de hoja. Blue cheese is often sprinkled on meat entrees or added to salads. Unpasteurized milk is found in many types of blue cheese, which can potentially your risk of contracting a food-borne illness and passing it to your child, notes CBSnews.com. 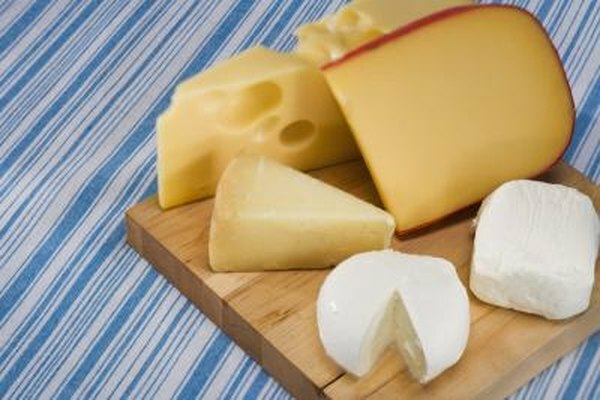 Opt for hard cheeses such as Monterrey jack, cheddar or mozzarella because they are produced with pasteurized milk. Although feta is a similar cheese, avoid it as well because it too is made with unpasteurized milk. Brie cheese is often spread on toast or consumed with crackers. Although it is a commonly used cheese, many types are made with unpasteurized milk, report Connelly and Ricciotti. Eating contaminated brie cheese may lead to potentially fatal fetal infections, stillbirth and miscarriage. Cream cheese is a safe alternative that can be consumed with the same foods as brie. Cream cheese is considered safe for pregnant women because it is pasteurized during the manufacturing process.